Choice chunks of clear Herkimer quartz crystal are sent to be faceted into familiar traditional gemstone shapes. Their beauty has exceeded our expectations; we hope your's as well. Cut quartz crystal gemstones are flawless to the naked eye. Under a 10x loupe, more than 95% of them are flawless. All have excellent AA grade clarity. These machine cut Herkimers are calibrated for manufactured jewelry settings. Herkimer Diamonds are comparable in weight to real diamonds. Some may have a smoky, deep hue or golden hue from associated minerals such as black hydrocarbon and iron oxide. If this is the case, it will be noted. 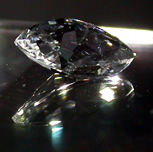 Due to the cost of faceting some of the smaller gems, usually 3 mm and less, a cost of $5.00 per gem is charged. Some photos are representative of the crystal you are purchasing. Cut / Shape $ Price per ct.